You wouldn’t know that sequoias’ orange, spongey bark is relatively fire resistant. It feels vulnerable to the touch and a knock to the trunk sounds hollow. But these giants move forward - they grow up and they grow out - when fire licks the ground around them. 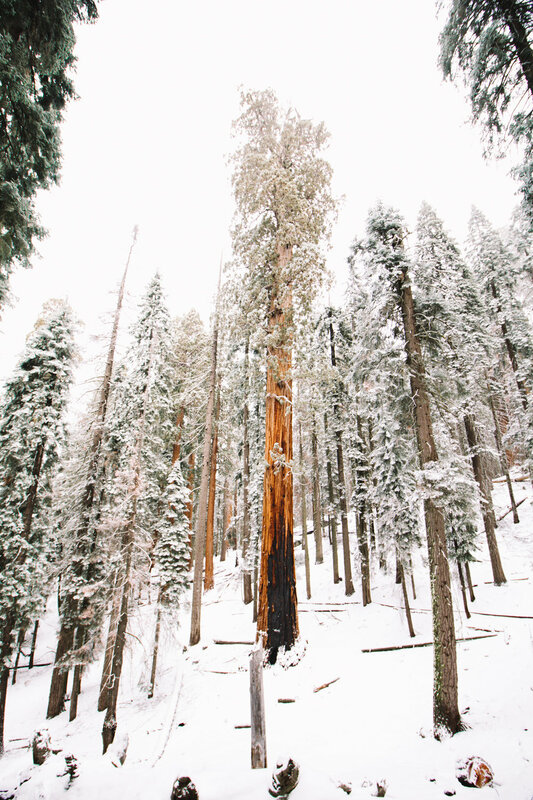 Their scarred trunks are testaments to the the thousands of years they’ve witnessed on earth, and their ability to use the fire that weakens their surroundings is what helps them grow to be the largest trees in the world. The biggest trees in Kings Canyon and Sequoia display deep cut burn scars at their bases that take years to heal. It’s a beautiful parallel to our own human existence - we experience trauma, hurts, and loneliness, and time, above all else, helps us to heal. Too many fires close together and like the sequoias, we break, but with a little luck, our bark has had enough time to cover the last scar before a new one cuts into us. And no matter what, we move on - we grow up and we grow out - because it’s what we have to do. Sequoias only started growing on earth about 4,000 years ago, a relatively new development considering the history of the world; about 400 years before ancient Greeks started to flourish and about 700 years before Moses led the Israelites out of Egypt, for context. Their trunks grow out after they reach a 275ft or so, making it a grecian pillar, the same width at the bottom as at the top, towering over the landscape as a living statue. Their scale stops you in your tracks and draws your gaze upward to their mounded tops, a sign of their maturity, and one of the many characteristics that makes them a unique tree. 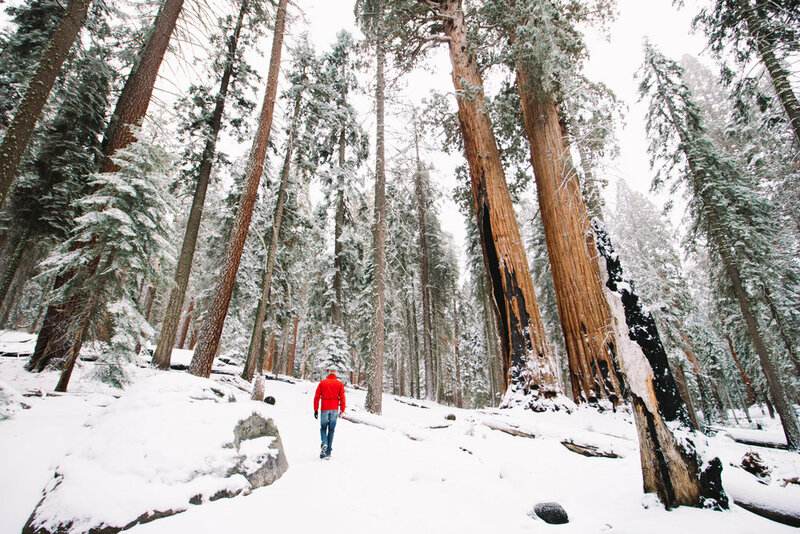 We’ve all heard about the benefits of being in nature and getting outside, and a trip to the sequoias offers all of that, in addition to a reminder of how to live. Evolution allowed for these awe inspiring giants to grow in the very specific conditions of the Sierra Mountains in California, during a time period when it was just warm enough and just cold enough and with just enough rainfall, but not too much, at just the right elevation. They are simply growing into their design, and being in their presence is a reminder for us to do the same. When visiting Kings Canyon & Sequoia National Parks, you can arrive from the North (via Squaw Valley, entering Kings Canyon first), or from the South (via Three Rivers, entering Sequoia first). The General’s Highway, a 25 miles road connects the two parks, but is often closed during the winter due to snow. If you’re arriving after a snowfall, make sure you have chains in your car (the rangers will not let you drive on the roads without them) and arrive early. Park rangers will turn guests away once the park reaches capacity. One way to avoid the hour long windy road into the parks from the nearest town is to stay in the parks at one of their lodges. Wuksachi Lodge is located within Sequoia National Park, about 6 miles from the famous General Sherman tree. The restaurant and bar are located in the main lodge, while the rooms are located in three separate buildings a short walk away. In the winter, the Lodge is the only sit down restaurant within Sequoia National Park, so a stay here means eating at the Lodge for breakfast and dinner. We were pleasantly surprised by grass-fed beef options and fresh salads. Overall the lodge and the restaurant were good. It’s a much simpler set up than the Majestic Yosemite Hotel (formerly the Ahwahnee), and the pricing reflects that. We recommend upgrading to a mountain view room so you can see the sunset hues on the snow capped peaks in the evening. Further north is Kings Canyon National Park and the John Muir Lodge. If Wuksachi Lodge is a 3 star accommodation, think of John Muir as a 2 star accommodation. With less amenities than Wuksachi, it’s charm lies in it’s location in the heart of Kings Canyon with easy access to trails and sights. If you don’t want to stay at one of the Lodge’s, Clingans Junction, located an hour from the entrance to Kings Canyon National Park, is a charming option with a delicious coffee shop on site. Insider tip: if you’re planning to visit both parks, we recommend 2 nights in Kings Canyon and 3-4 nights in Sequoia. It’s 2.5 hours one-way between the two parks if the General’s Highway is closed, so it’s worth it to stay in each park separately to explore the trails each park has to offer. 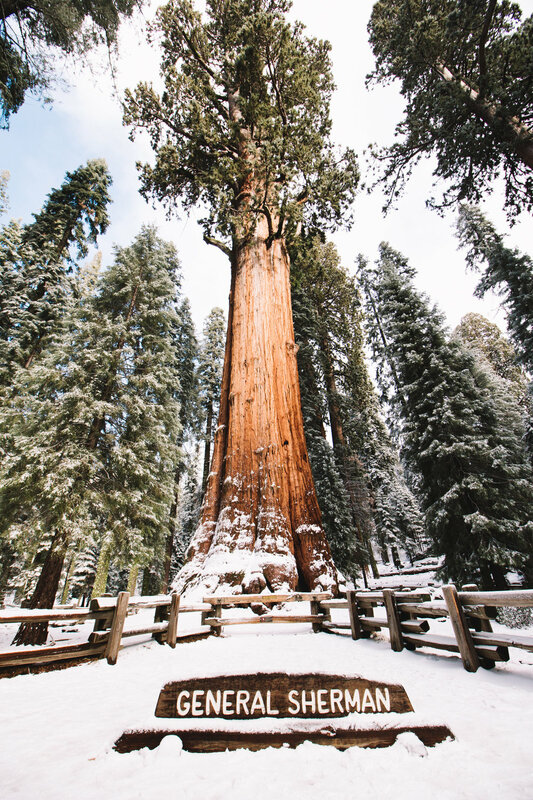 A visit to General Sherman, the world’s largest tree, is a must and can be easily accessed from a short trail off of General’s Highway, a few miles south of Wuksachi Lodge. After admiring the giant that is General Sherman, continue on The Congress Trail, 2.3 mile loop through Giant Forest. A paved, busy trail in the summer, this trail empties out with a snowfall, providing you with a peaceful stroll through a gorgeous stretch of sequoias. You’ll pass by “the Senate” and “the House”, two sequoia groves with a dozen or so sequoias impressively clustered together, and “the President”, an imposing giant that’ll make you wish you could vote trees into the highest honor in the land. Located in King’s Canyon National Park, the General Grant Loop trail is a short loop that weaves through giant sequoias and provides the perfect introduction to these majestic trees. Perhaps our favorite hike of the trip even though it had barely any sequoias was the Tokopah Falls trail in Sequoia National Park. The full out and back trail follows the Kaweah River, with the falls as the main attraction in the middle, and stunning views of the Sierras the whole way. If you pack accordingly and start early, Heather Lake trail will provide a peaceful workout with stunning views. We went about a mile and a half in before turning around, but would have loved to spend more time on this trail had we prepared for a longer winter hike. Some other hikes that we completed, but liked less (so if you’re short on time, we recommend prioritizing the others first): Big Stump Trail, and Big Trees Trail. Also, these popular summer sights are inaccessible in winter: Panoramic Point and Cedar Grove in Kings Canyon National Park; Moro Rock and Crystal Cave in Sequoia National Park.